The Home Bazaar Chapel Bell Bird House (HB2047) is a bird house like no other. It's a triple deck bird house. The chime goes off whenever a bird visits or returns to the house. It is a one of a kind style and a wonderful reason for you to add it to your collection of bird houses. It is a great gift idea for those who love the hobby or just for someone who loves the outdoors. It has a removable back wall so you can have hassle free cleaning whenever needed. It can also be a decorative piece inside your house that is good for a conversation piece. 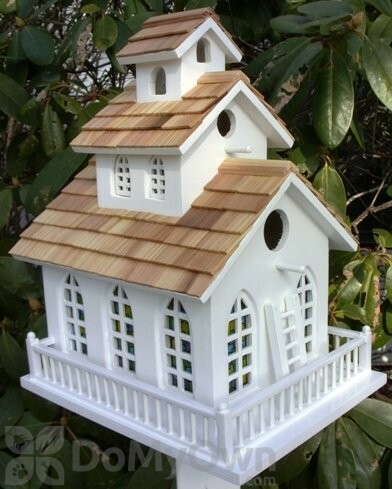 This bird house has a non-toxic paint for the safety of the birds and an entrance hole of 1 ¼ inch to accommodate Wrens, Chickadees, Finches and others. How is Home Bazaar Chapel Bell Bird House mounted ?Would it fit on a 4x4 post? The Home Bazaar Chapel Bell Bird House has a flat bottom and would need to be mounted on a post or pole of some kind. Per the manufacturer, here are some Youtube videos for suggestions.